Get It Done Mommy: Free Cone Day! Get It Done Tip: It's all about bribery! Tell the kids to hurry about and get that homework done, clean up their messes and take them out to Ben & Jerry's for a free ice cream cone. 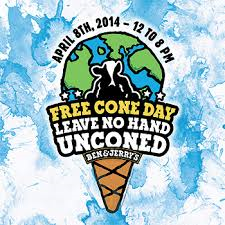 Between 12-8 today they are giving away free single scoop ice cream cones. Enjoy!